All students intending to graduate must apply for graduation. Responsibility for meeting all graduation requirements rests with the student. By submitting your graduation application, you acknowledge that you have reviewed your degree evaluation (CAPP) in Banner Self-Service and understand your graduation eligibility. For additional information, refer to the appropriate section below. Completion of the required senior assessments. When calculating the major or minor GPA, only the highest grade in each course will be used. No more than 64 semester hours of credit from a two year college may be applied toward degree requirements. No more than 45 combined semester hours of credit earned through Advanced Placement (AP), College Level Examination Program (CLEP), International Baccalaureate (IB), Cambridge Advanced International Certificate of Education (AICE), and military credit may be applied toward meeting degree requirements. Although students with a financial obligation to the University may be permitted to participate in commencement exercises, official transcripts and diplomas will be withheld until all financial obligations to the University are satisfied. In addition to the General Education curriculum, students seeking the Bachelor of Arts degree must complete the second year course sequence (201 and 202) in French, German, or Spanish. Completion of the foreign-language requirement is based on proficiency. Students have the opportunity to take a foreign-language placement exam to determine if they may start their language studies beyond the 101 level. A student whose level of language proficiency makes it possible to bypass one or more lower-level language classes will reduce the number of hours required to complete the language sequence but will not reduce the total number of hours required for graduation. For example, a student who places in FRN 102 as a result of the placement exam will not be required to take FRN 101 but will not receive the credit hours for FRN 101. Information about the placement exam is available from the Department of English and Foreign Languages. Students seeking the Bachelor of Science degree must complete a total of 18 or more credit hours in mathematics and science. For information about the Bachelor of Business Administration degree, refer to the College of Business section of the Bulletin. For information about the Bachelor of Fine Arts and Bachelor of Music degrees, refer to the College of Fine Arts section. 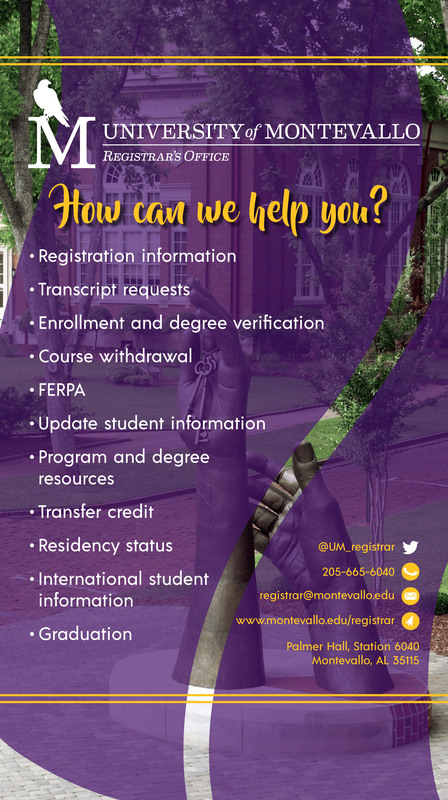 Students who have previously completed a bachelor’s degree from the University of Montevallo or another regionally accredited institution may pursue a second bachelor’s degree at the University of Montevallo. Students who have completed a bachelor’s degree and are pursuing a second bachelor’s degree of the same type (B.A., B.S., etc.) will be considered as having completed the General Education requirements. Students who are pursuing a second bachelor’s degree of a different type may be required by the department offering the degree to complete additional General Education courses. A minimum cumulative overall and institutional GPA of 2.0. Students who have formerly earned a bachelor’s degree at UM must meet the above requirements in addition to previously completed coursework. Additional coursework to meet standards including, but not limited to, course prerequisites, program accreditation, teacher certification, or graduate program entry may be required. All requirements should be reviewed with the academic adviser. Students who select two majors must meet the degree requirements of both majors, including the General Education requirements. If the majors are in different degree programs, students will receive two diplomas simultaneously at graduation. The recipients’ names will be listed in the printed commencement program under both degree programs. Students who intend to earn teacher certification should review requirements with their advisers during the freshman year. Information regarding teacher education programs is included in the College of Education section of the Bulletin and in the undergraduate Teacher Education Handbook. Graduate students may participate in Spring Commencement only if all degree requirements have been completed by the ceremony. have obtained at least a 2.0 cumulative GPA. Names of all participants will be printed in the program. Therefore, a student may participate in only one commencement ceremony. The “degree conferred” date on the student’s diploma and transcript will correspond to one of the three dates that UM confers degrees (see Academic Calendar). All graduation requirements and financial obligations must be satisfied in order to receive the diploma. Undergraduate honors designations are determined by final UM GPA. Therefore, honors designations will not be indicated in the program for those who participate in a commencement ceremony prior to completion of all degree requirements. Appropriate honors designations will be printed on the diploma. Any exceptions to this policy must originate with the student’s Dean and will require the approval of the Provost and Vice President for Academic Affairs. Graduate students are expected to conform to the rules and regulations of the University of Montevallo. The responsibility for meeting the requirements for a degree or certificate rests with the student. Students will be allowed six years from the date of enrollment to complete graduate degree programs. No course more than six years old will be accepted for credit toward a graduate degree unless the student has petitioned the department chair and the college dean for an extension. If an extension is granted, the chair and college dean will decide the validity of courses rendered more than six years old by that decision. Successful completion of an exit examination (oral, written, portfolio, capstone project, etc.) on all graduate work will be required of each student in partial fulfillment of requirements for the master’s or Educational Specialist Degrees. Exit exams may be attempted no more than three times. The exam typically is taken when the student is within six hours of completing the program. Contact the department office for exam registration deadlines. Master’s degree programs: A minimum of 30 semester hours is required for the master’s degree. A full-time student who is required to write a thesis must earn a minimum of 24 semester hours in coursework. The thesis together with the coursework must total a minimum of 30 semester hours. Some degrees require more than 30 hours. Ed.S. programs: A minimum of 30 semester hours is required for the Ed.S. Degree. Master’s degree programs: For the M.A., M.B.A., and M.S. programs, a 3.0 GPA is required on all work attempted for retention and graduation. The M.Ed. programs (with the exception of M.Ed. Counseling concentrations in Clinical Mental Health, and Couples & Family, which require a 3.0) require a 3.25 GPA. A graduate student whose grade point average falls below the required minimum GPA will be placed on academic warning. The student has one term of enrollment in which to raise the overall GPA to the requirement minimum. May and both summer sessions together count as one term. Failure to raise the grade point average to the required minimum as prescribed above will result in dismissal from the graduate program. The minimum passing grade for a graduate course is a C. A course may be repeated only one time if a grade lower than a C is made and the hours will be counted as hours attempted. Courses may be repeated only at UM. Ed.S. programs: For retention and graduation, a 3.5 average on a 4.0 scale is required on all work attempted (with the exception of the Ed.S. Instructional Technology program, which requires a 3.25). A student whose GPA falls below 3.5 will be placed on academic warning. The student has one term of enrollment to raise the overall GPA to 3.5. May and summer sessions count as one term. Failure to raise the GPA to 3.5 as prescribed above will result in dismissal from the program. The minimum passing grade for Ed.S. courses is a C. A course may be repeated only one time if a grade lower than a C is made, and the hours will be counted as hours attempted. Courses may be repeated only at UM. Final Semester GPA: A graduate student’s graduate GPA is calculated only on the current program of study. Students who come to the end of their program or to the internship without the required GPA, having never been placed on academic warning, will be allowed to repeat up to two courses (where grades C, D, or F were made, and a B in Instructional Leadership) completed during the semester in which the GPA fell below the required minimum, as long as the grade(s) earned in the repeat(s) have the potential to restore the GPA.